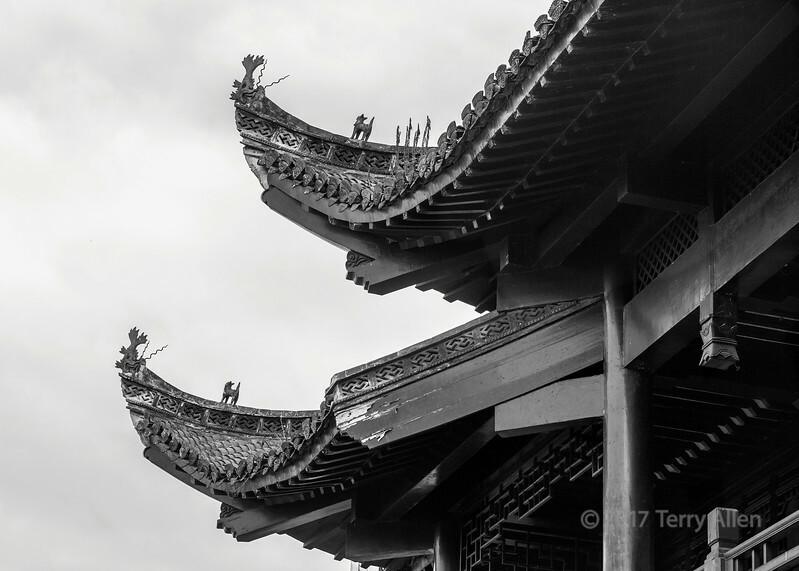 The decorative roof ends of an ancient building, near Huizhou Ancient City, Huangshan, Anhui, China. Chinese imperial roof decorations or roof charms were statuettes placed along the ridge line of official buildings to protect the building. I have always loved the upsweep of Chinese rooftops. I'd seen the roof charms, but did not know the significance of them. Effective in B&W. Well done in black and white. Nice comp. Super detail of these architectural ornaments. I think the BW processing frees the mind, and I get a suggestion of dragon heads in the two roof peaks (for lack of a better name).